ahh, at last, what i hoped for. 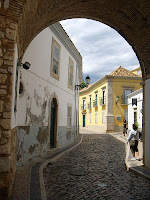 Today it was cloudy, so we went to Faro, and it was the Portugal I´d been hoping and looking for. 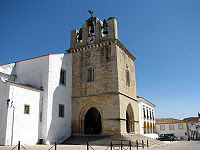 Old Faro, inside the walled city, is beautiful, from the 16th and 17th centuries, when the Moores conquered. We saw the amazing catedral (second photo) and walked all through these tiny cobblestone streets, (top photo) with brightly painted doors, and intricate iron balconies and window treatments. My mom would love this part. A grrreeeat day. My camera´s battery died halfway through the day, so Sheila has most of the photos on her camera, and I won´t get them for a few weeks still. In other news, my heart is lighter, and I had a great conversation that reminded me so much of who I am, who I should be, and who I long to be. Praise and thanks, with much love. Tomorrow we head off early to Lisbon (Lisboa, pronounced lish-boh-uh) and I´m super excited. When we flew over and in, it looked awesome, and I became excited and certain that I wanted to get up there. Speaking of which, Portuguese drivers are CRAZY!! They are rude and drive very fast, and much of the time I wonder what they are thinking?! But, as for the roads themselves, I love driving in Europe, it seems easier, less confusing, for the roadsigns are based entirely on final destinations, so you follow the signs to where you want to go, rather than needing to know directions. Cake. We have yet to get out dancing. We spent our St Pattys Day at an Irish pub up the road, which was chock full of old Irish and English folks, but lots of fun. We went home earlish, to nap before really going out since bars happen here from 12-3, and then dancing from 3am on. out of time, more to come, with love!